These are the words for a song written during the Great War (1914-18) by the girls of Light & Co.’s Munition Works located in Circus Street, Brighton. It went on sale and the proceeds were used to provide comforts for British wounded soldiers in Brighton Hospitals. Click on the photograph to open a large view in a new window and then click again to magnify. Do you know the tune that accompanied this song? Hello Linda. No sorry, I don’t know the accompanying tune. Sadly Dora passed away several years ago, but I am hoping that someone may come up with the answer. My Grandmother Nellie Piper worked here and I can certainly remember my mother singing this to me.I have a pic of her and the girls at this time. Hello Karen Would you be able to scan your photo and add to the site as I would love to see if Dora is in it? 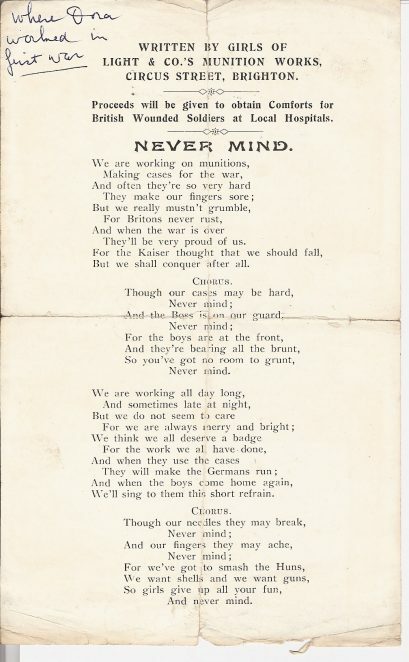 If you would be happy to share any family memories about the munitions factory for the Great War exhibition at Brighton Museum this summer, I’d love to hear them. It can be difficult tracing the work that women did in Brighton and Hove during the Great War. I can be reached on 01273 292845 (Brighton Museum, Local History).